Welcome back! In part 1 we took a look at Visual.ONS (this year’s biggest highlight for our team) and how it related to some of UKSA aims to make statistics more helpful. We then looked at some of my favourite pieces of content from the course of the year. Let’s carry on. Part of improving communication can be to reduce the amount of jargon and technical terms used. We strive to do this in anything we create, but sometimes a concept can be inherently difficult to understand and so we’ve experimented with explainer pieces. It’s a format other publishers have experimented with, such as these from the BBC. We can’t always rely on other organisations for this though and it’s important that we have unbiased content to point people towards when they’re having difficulty (on platforms like Twitter). 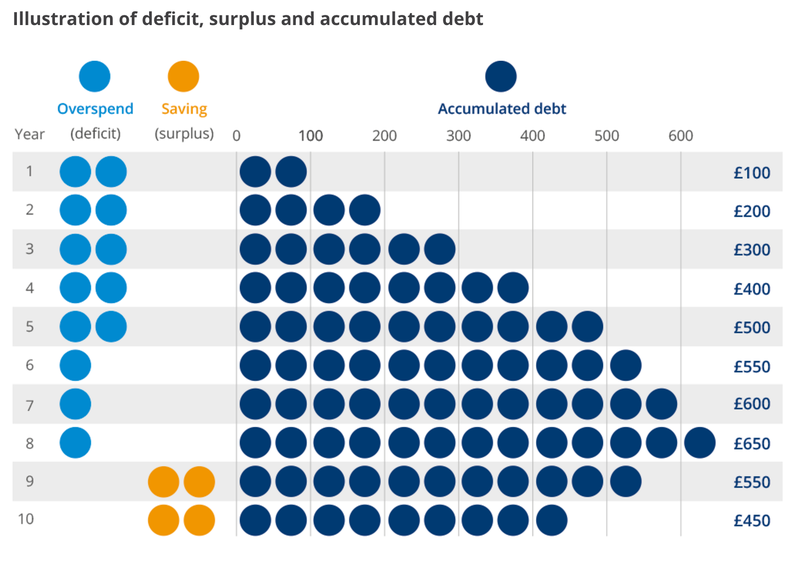 One example of a concept we saw people having trouble with was the UK’s debt and deficit and so with the help of the Public Sector finance team we put together a short explainer piece looking at debt and deficit. Do you understand the difference between debt and deficit? One of our most viewed posts this year was a fun look a how popular culture has influenced baby names. Every year the baby names release tops the ONS’s most viewed chart. It’s a release that divides opinion within ONS. Some people despair at its popularity compared with more critical outputs, while others revel in it. 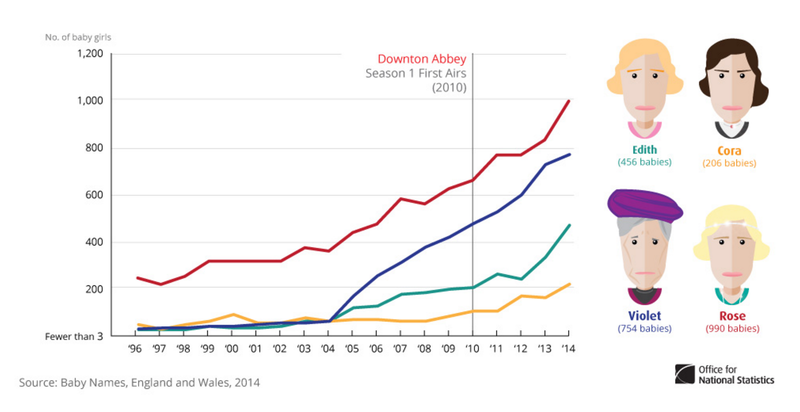 Downtown Abbey’s influence on baby names? However, there’s no denying that it’s a release that could be useful to thousands of expectant parents every year and everyone has that natural curiosity as to how their name compares, so some analysis and promotion of the data seems appropriate. It’s a subject that allows more creative freedom compared with a piece on the state of the economy (for example). This post from earlier in the year talks about some of the thinking behind the piece and how it was received, but needless to say that it was incredibly popular and syndicated far and wide. You know it’s done well when it makes your Facebook news feed independently! While a lot of our time has been focused on delivering content for Visual.ONS there are many other activities our team have been leading over the past year. We’ve been busy continuing to run GSS training on the Introduction to Data Visualisation and earlier this year we launched a data visualisation section on Style.ONS. This is seen as something that complements the training – the training goes into much more of the reasoning behind data visualisation principles. The reaction has been really positive. We also had the pleasure of taking part in an AMA on the Data is Beautiful sub-Reddit. It was a fun couple of hours – take a look. Our social media team have been more active on this blog so I won’t talk so much about their work but they’ve been busy with social media reviews, budget and autumn statement among other work. There have been a number of departures for pastures new. Notably Alan Smith, (former head of the digital content team) took up a prominent role as Data Visualisation Editor at the Financial Times in September. Alan had been at ONS for a number of years, launching the Data Visualisation Centre over seven years ago. It’s fair to say that his work has been something that ONS has collectively been proud of. He leaves a legacy that we will continue to build upon. Over the course of the year we’ve also welcomed several new additions to the team with varied backgrounds. This has further grown digital content team into a truly multidisciplinary team of researchers, data visualisation developers, graphic designers, editors and social media specialists. Early in 2016 we look forward to welcoming Darren Waters, joining us from the Press Association as our visual journalism lead.